The first thing to note about “Chapter Eighteen: When A Stranger Calls” is that there’s no Jughead voiceover. And why would there be? As the episode progresses, Jughead becomes more and more out of the loop about what’s going on in the Northside. He’s not the typical observer here, getting his news about the rumble from Sweet Pea and not even being invited to a Jingle Jangle-fueled hotel party. But he’s also not as in the know because the people who would allow him that access—Archie and Betty—are keeping those things to themselves. Archie isn’t telling Jughead the full extent of his Red Circle activities and Betty is specifically using the party as an outlet to ruin her friendship with Veronica. Becoming more than half a Serpent removes Jughead from his storyteller role and into something else. Something separate from the people he loves. Because he can’t just be an observer when it comes to the Serpents, and this episode finally explains why that truly is. Even in this episode, Riverdale mostly shows the Southside Serpents—despite the fact that they’re a gang—more as a tight affiliation of Southsiders than it does a dangerous part of the community. Part of that is just the fact that there are so many of them; in Riverdale, you can’t even turn a corner without bumping into a Serpent. It creates the illusion that one really doesn’t have to do much in order to join their ranks. And since Jughead was given the Serpent jacket as a legacy in the first season finale, it appeared that all he needed to do was publicly wear it in order to be part of them. There’s also the fact that the pipeline for hard drugs in Riverdale and the Northside is specifically tied to rival gang (and possible cannibals) The Ghoulies and the late Clifford Blossom. The worst you’re going to get from a Serpent is some marijuana. But there’s also the Serpents’ very real frustrations with the fact that they’re the scapegoats for the Northside and their troubles. Last week, Dilton Doiley stabbed himself during the rumble, and now it’s front page news at the Riverdale Register. As is the blame on the Southsiders, making them once again the victims of Northside finger-pointing. So Riverdale has been and is quite deliberate in its smoothing over the edges of the Southside Serpents. So a scene of Jughead being jumped in is a very important one to have. As is Toni’s warning to Jughead beforehand. Even if the first part of initiation is something as cute as taking care of “the beast,” Hot Dog,” that’s not what the Serpents are. That’s not the type of thing that’s enough to trust someone with your life. It’s a lesson that’s a little less heavy-handed—though the jumping in scene is another beautifully hyper-stylized Riverdale moment—than the majority of the Veronica/Nick St. Clair storyline. In “Chapter Fifteen: Nighthawks,” I addressed how much of Archie’s storyline hit after school special territory, and with the introduction of Nick St. Clair, Riverdale veers close to that again. But then you have scenes like the Jingle Jangle party, where the only person who ends up arguing against it (Betty) is only doing so for ulterior reasons. And despite the constant talk about that drug, the next day aftermath isn’t a big deal (or a deal at all), basically siding with Veronica’s argument that it’s a “normal” teen thing to do. You also have the scene where Nick offers Veronica and Archie cocaine, and it’s no big deal for them to say no. Because this storyline isn’t so much about Veronica trying to reclaim her past as it is her trying to help her parents, the typical beats aren’t quite as typical on her side of things. Of course, Graham Phillips’ portrayal of Nick is basically a flashing light that says, “I’m Chuck Bass,” which is glaring in an episode full of more understated performances. I’m even counting Cheryl Blossom’s episode entrance—posing in a school doorway—as understated in comparison. But what Nick’s existence leads to makes it worth it. That this storyline is so oddly prescient and timely is impressive on Riverdale’s end. However, it’s the conclusion, as Veronica and the Pussycats come to Cheryl’s rescue and beat the crap out of Nick, that makes it all worth it in a way. Not just because of #feminism or “sisters doing it for themselves” but because it’s an uncharacteristically triumphant moment of absolute power from any of these characters. Remember, even something like them discovering Jason Blossom’s murderer wasn’t so much a moment of triumph as it was one of disgust and terror. Characters preventing a sexual assault is one of the most “normal” things to happen in Riverdale, and that they get to literally stand tall over Cheryl’s attacker is deeply cathartic. This is needed in an episode where Betty Cooper, the true hero of Riverdale, is stuck unable to fight. Following up where “Chapter Seventeen: The Town That Dreaded Sundown” left off, Betty spends this entire episode communicating with the Black Hood and doing his bidding. As his letter to Betty stated last week, he’s doing this all because of her. He’s doing this for her. However, with this episode, the Black Hood proves that that devotion is not a one-way street. These acts of devotion require Betty to cut people she loves—Polly, Veronica, Jughead—out of her life, before the Black Hood does it himself. It also provides more of an argument for Hal Cooper being the Black Hood. Or at least, Hal Cooper pretending to be the Black Hood. Here, we learn that the handwriting from the Black Hood in his first letter (to Alice Cooper) and his second letter (to Betty, with a cipher) don’t match, suggesting a copycat. It’s a key plot point that Betty doesn’t focus on though, because Alice immediately suggests it means that Betty made up the second letter “to get attention.” Even with the Nancy Drew smoking gun, it’s an intensely cruel thing to say, but it does motivate Betty to do the Black Hood’s first piece of bidding in the form of publishing teenage Alice’s mugshot. As he explains to Betty: “She’s a thorn in both of our sides, your mother.” Yes, spoken like a true cuck. Especially if you consider that Hal might want to “punish” his wife for the way she kicked him out of the house last season, for the way she said he didn’t have the stomach to be Jason’s murderer, the way she rolls her eyes when he does something like add another lock to the house. Of course, as the Black Hood also tells Betty not to tell anyone about these phone calls or where she got the photo from, you also have Hal asking her why she would do this. So he has firsthand knowledge that she didn’t betray him, if Hal and the Black Hood are one and the same. But the key here (with this theory) is that Hal is the not the real Black Hood. Betty tries to test that he’s real by getting him to quote the cipher (“I will strike back where it all began.”), and the only other people who have that answer are Jughead, Alice, Hal, and Sheriff Keller. (There is an argument to be made that it is actually the Sheriff then, but let’s not imagine he’s obsessed with his teenage son’s best friend. At least not yet.) And the thing is, the Black Hood doesn’t actually do anything in this episode. I’m not just talking about that in the context of the Black Hood being a terrible serial killer either: The person Betty speaks with keeps threatening to hurt people, but he never actually does. You could say that’s because Betty does what he tells her to do, but you could also say that’s because he has no ability to actually do anything. He’s using that fear he knows Betty will have for her (less than reputable) friends to convince her to get rid of them. As traumatizing as this all is, it’s even more unsettling if it’s the result of a parent who found the ultimate way to convince his child to stop hanging around with her bad influence friends. No matter who it is, however, Archie is right to call it torture. It possibly being Hal Cooper or a copycat doesn’t actually change that or lower the stakes. It takes a lot to see Betty Cooper broken, and that’s essentially what the Black Hood does here. While Jughead struggles, he ends up finding community in his struggles. Veronica ends up kicking her bad girl past to the trash. Betty gets nothing out of any of this but loneliness and pain. And like Jughead and Veronica, she’s doing this to protect people as well. Where’s the fairness in that? This episode is a terrific acting showcase for Lili Reinhart, as much as it stings it has to come under the circumstances of a tortured Betty Cooper. And after an episode confirming that Betty’s ponytail is “iconic and beyond reproach,” it only makes sense that her hair comes down (and remains down) in this episode when she loses the other things near and dear to her. The people that she loves. Her sense of self. And she has to do this all alone. Sure, she tells Archie—then tries to hide things from him, then tells him again—but this is truly Betty’s struggle. There’s a parallel between the scenes where Betty ends her friendship with Veronica and Archie dumps Jughead for Betty (and kind of for himself in that moment too). Both are a case of narrative serendipity, but they also involve these characters smartly taking their terrible shots. For Betty, she has the perfect opportunity in being the only sober person at a party with her friends high on Jingle Jangle. Again, in another excellent acting moment from Lili Reinhart, you can even see Betty’s face of realization that she knows she needs to do it now. And as soon as Veronica sees her look of frustration and approaches her, it becomes the perfect moment. With Archie, he’s fueled more by anger but—perhaps in a moment of growth from his Red Circle debacle—takes that anger and transforms it into fuel for his actual reason for being at Jughead’s. He’s legitimately upset with Jughead, but in perhaps the smartest moment of his short television life, Archie sees his opportunity here and takes it. Both Veronica and Jughead are blindsided in these moments, but it’s the best possible scenario for either of these awful moments. “Chapter Eighteen” is a stressful episode of Riverdale. Veronica gets a win out of it, and Jughead gets a bizarre version of a win (based on the worst circumstances possible), but Betty seemingly loses everything to even make sure the former are able to survive. And she even loses herself, when she essentially puts a hit out on Nick St. Clair. It’s definitely not your typical Betty Cooper Wednesday night. That a psychopath who says he’s doing this all for her—and confirms she would recognize him—puts this much mental and emotional strain on her puts a similar amount of strain on the audience. Because who else could this show choose to face this turmoil and still have it weigh as heavy on their heart? Riverdale is very aware of the strength of both Betty Cooper and Lili Reinhart, and this is the episode where it puts that awareness on full display. It also does so with the introduction of its most smarmy character to date (New Reggie has lost his crown), so it’s a strange balance. But it works. Riverdale Roulette: I feel like if I say the movie version of Rent people will get upset with me. And I know I suggested it back in “Chapter Six: Faster Pussycats! Kill! Kill!” but I’ve just got to do it again: Josie And The Pussycats. Come on, the Pussycats beat the hell out of an evil (budding) music producer at the end of this episode. Speaking of, that Hiram’s line about Nick being a “budding music producer” doesn’t lead us down a plot about Archie trying to decide between sucking up to Nick and being a good boyfriend to Veronica is proof positive that the Riverdale writers have really taken The Archie Problem to heart. Also, Hiram and Hermione Lodge are still scheming real estate tycoons in this episode, but in terms of their recent moments of Bad Parenting, this is a decent episode for them. Surprisingly even, as their first scene where they suggest Veronica play the role of “corporate concierge” to Nick has warning signs of them possibly going as low as to pimp their daughter out. You practically expect a subsequent scene of Hermione having a “heart-to-heart” with her daughter regarding what they expect. But it never comes, and when it comes to this particular storyline, the only true villain is Nick himself. Jughead: “What happened?” Exactly, Jughead. Exactly. What is it with these Riverdale kids and their animal masks?! We’re denied yet another awkward Riverdale dinner between the Lodges, the St. Clairs, and Archie, but at we’re informed that Hermione makes flan. my notes: “I’m sure you won’t, Dr. Luke.” Like I said, it’s not surprising that Nick’s story hits most of the beats that it does, but at least it ends with some very good retribution. Also like I said, this plot is extremely topical, especially when Nick tells Veronica about this struggles with rehab. Jingle Jangle: It makes Josie make out with New Reggie and Kevin… show us he should never dance again. Even if he is seated. Betty: “No. We can. And we will.” Betty is absolutely killing herself bending over backwards to appease the Hood. 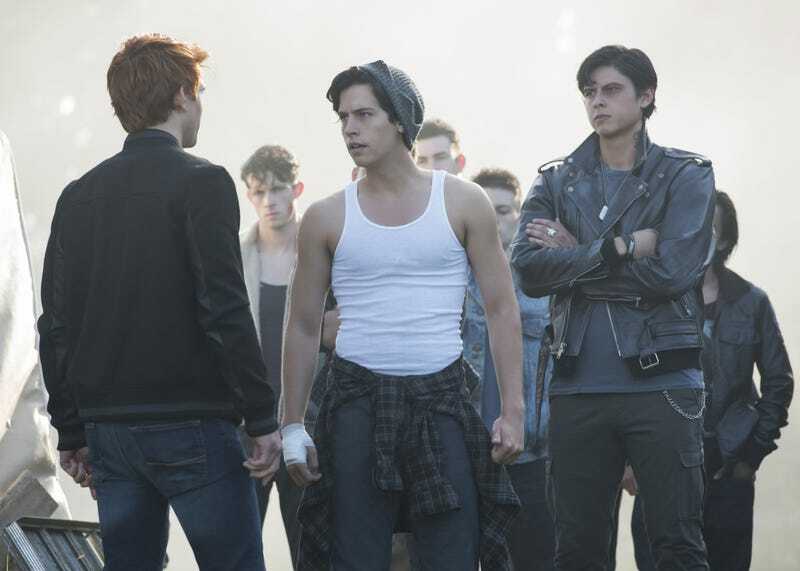 Archie: “Jughead, these are the guys who attacked me. Who attacked Reggie and Veronica and Dilton. Your friends.” So that’s absolutely not true, as it was a rumble, initiated by Veronica, after Archie first pulled a gun on Sweet Pea. And Veronica is the one who shot a gun into the sky, as Sweet Pea also mentioned. Also, please stop pretending Dilton Doiley is part of your inner circle. The kid stabbed himself to make it look like the Serpents did it. Though I suppose I believe that, in the rain, Archie truly did think it was the Serpents who did the stabbing. After all, Sweet Pea first pulled a knife on Archie in said gun scene. Hiram: “The Southside as we know it will be gone, replaced by a new Eden.” And I suppose that makes Hiram the snake. A reminder that Josie and Cheryl are BFF, however that may be: Josie gets a quick jab in on Nick before she goes to check on Cheryl. She knows how to prioritize.